Build your own construction site with Clicformers! This Clicformers Construction Set is the favorite of all future builders. You will be able to make your own construction machines with the 49 building blocks and 25 accessories of this set. The Clicformers construction machines are cool and robust, exactly as it takes to survive on a construction site. With this Clicformers Set you build an excavator, a concrete mixer, a bulldozer, a ladder truck, a wrecker or a regular truck. You don’t need more to bring your buildings to a good end. The construction machines look lifelike with their moving parts. They stimulate creativity and imagination and make children all the way into a role play. They stimulate creativity and imagination and let children go all the way into a role play. The construction Set of Clicformers is good for hours of educational play fun and mutually compatible with all other Clicformerssets. Children build by using Clicformers on their motor and cognitive development while they play. In other words: learning by playing has never been so much fun. 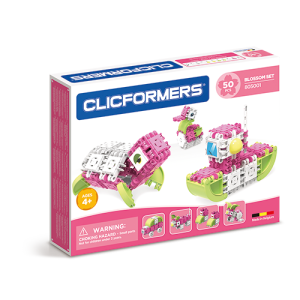 This package contains a step by step guide to build all Clicformers construction machines, but with some imagination, children easily build their own Clicformers creations. With the Clicformers Construction Set, children literally build on their future!